Whether you’re doing small home improvements or working on a huge construction project, eventually you may find that you need to cut into concrete. Whether you’re making small home improvements or working on a huge construction project, eventually you may find that you need to cut into concrete. This could be a concrete floor slab, a concrete wall, a concrete countertop, or something else. The reasons you may need to cut concrete are just as varied: to add a sink, install a drain, add a window, or many other reasons. Your first instinct may be to get a saw and DIY it, especially if you’re well-versed in common home projects. Before you do, read on for important issues to consider. The biggest safety issue about cutting into concrete is that you may also cut into something that is inside of it. Often, concrete slabs have various items embedded in them or secured against them, and because of the nature of the material ( hard, opaque concrete), you can’t see those things. This could include conduits for cables or electrical lines, pipes for plumbing, nails or other fasteners, and even rebar, among other things. Striking any of these as you’re cutting through the concrete could cause injury to you or people around you and might damage your equipment. While concrete dries to touch fairly quickly, it takes quite a bit longer to cure. Curing is the process through which the concrete completely dries and hardens all the way through so that the whole thickness is air- and water-proof. This process takes about 30 days on average. If your concrete is less than 30 days old, it’s too early to cut it. Cutting into uncured concrete can cause long term problems with the slab. 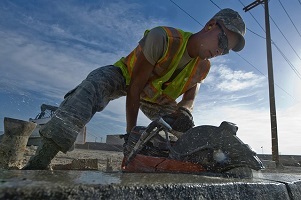 The bottom line is that concrete cutting is a job best left to the professionals. It’s not like picking up a handsaw to trim a board. Professionals have training, certifications, and years of experience performing all manner of concrete cutting tasks with a handheld concrete saw. They will know the best way to approach the job and have the equipment that they need. They will have the tools and training they need to avoid the hazards, such as ground penetrating radar that can help them see and avoid embedded items. They will also know what safety equipment and precautions are needed for the job to avoid injury and keep everyone safe. This entry was posted on Friday, March 22nd, 2019	at 10:33 am	. Both comments and pings are currently closed.